It's my favorite time of year—FALL. I love the color of the changing leaves and the crunch of nuts under my feet when I hike through the forest preserve. The light shines and shifts a little differently through the windows around my house and gives a comforting glimpse of things to come. Beckoning the excitement of Halloween, the thoughtfulness of Thanksgiving and sheer joy of Christmas morning for a child. So I've decided to send out a quarterly newsletter. The contents of the first one are below. Please let me know what you think. There are directions if you'd like to get the newsletter delivered to your mailbox and how you can enter to win the fall prize pack pictured at the bottom of this post. I don’t know about your neck of the woods, but here in Chicago the leaves are starting to fall. As the colors begin to change and the warm days of summer give way to cozy sweaters and your favorite pair of jeans, I thought I’d take a moment to update you what’s going on in my world. Most of you know me as an author, and we’ll get to that a bit later, but today I wanted to bring you something special in my first quarterly newsletter. Don’t worry you’ll only hear from me a couple times a year and I hope to share something on every visit from my first love, decorating. The picture above is the front stoop of my house. I decorate it every fall, and in a couple of weeks I’ll make it a little more Halloweenish, but until then the focal point is always the pumpkin topiaries. Yes, those are real pumpkins. How to your own pumpkin topiary. Supplies: You’ll need three pumpkins in large, medium, and small sizes, wooden/bamboo kebab skewers, hammer, and decorative accents, i.e. 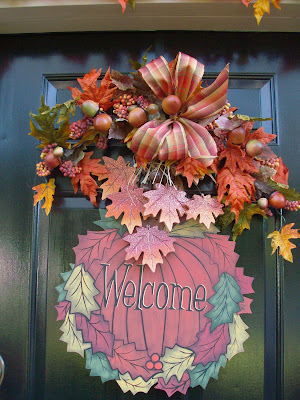 fall leaves, beads or garland. Make sure the bottom pumpkin, or the largest one is large enough to fit in your urn, at least part of its weight should rest in the soil. 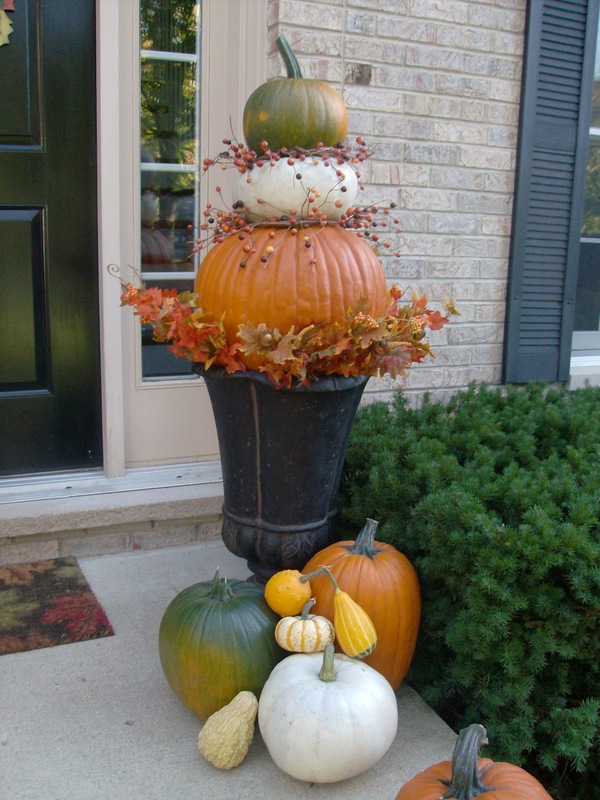 Place the base pumpkin in the urn, you do not have to cut or gut this pumpkin and do no remove its stem. Select your middle pumpkin, make sure you have one with a nice stem, cut a circle in the BOTTOM of the pumpkin large enough that it can fit over the stem of the base pumpkin, remove all the seeds and guts from the pumpkin. Now place this second pumpkin on top of the base pumpkin and hammer the long kebab skewers into the second pumpkin until the skewer reaches the base pumpkin. Take your time and hammer the skewer all the way in, it will secure the second pumpkin to the base pumpkin. I usually use about six skewers around the perimeter. Now repeat the same process to secure the top pumpkin as you did for the middle one, cutting out the BOTTOM and gutting it before securing this top pumpkin to the middle one with skewers. 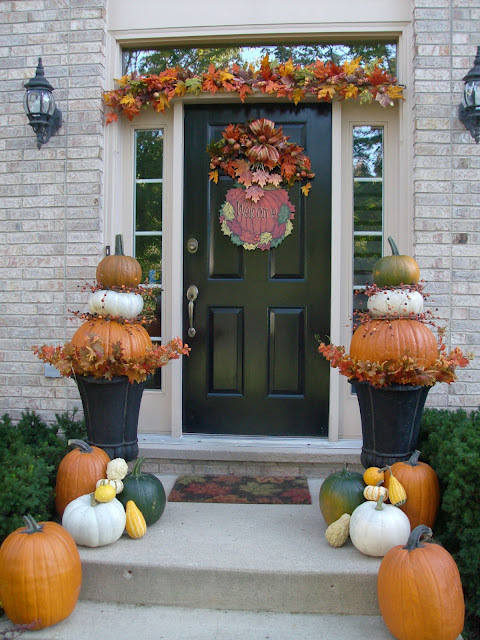 Now add plastic leaves, cattails, branches or Halloween tinsel around the base and fall colored garland for the in between layers. So take your family pumpkin hunting! 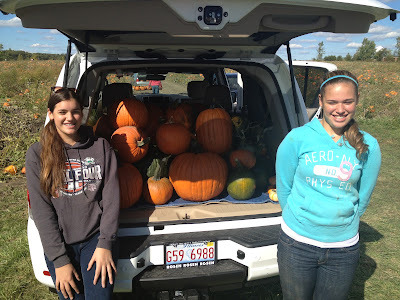 These are my girls last years after we hauled a truckload home! Yes, I buy them by the truckload! The girls were smiling because it was finally over and they could have some Caramel Apple Dip! In a medium bowl, beat together cream cheese and powdered sugar until fluffy. Spread mixture evenly onto a platter. 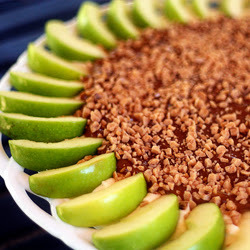 Spread caramel apple dip on top of the cream cheese layer. Sprinkle the top generously with toffee bits. Serve with thick slices of Granny Smith apples. 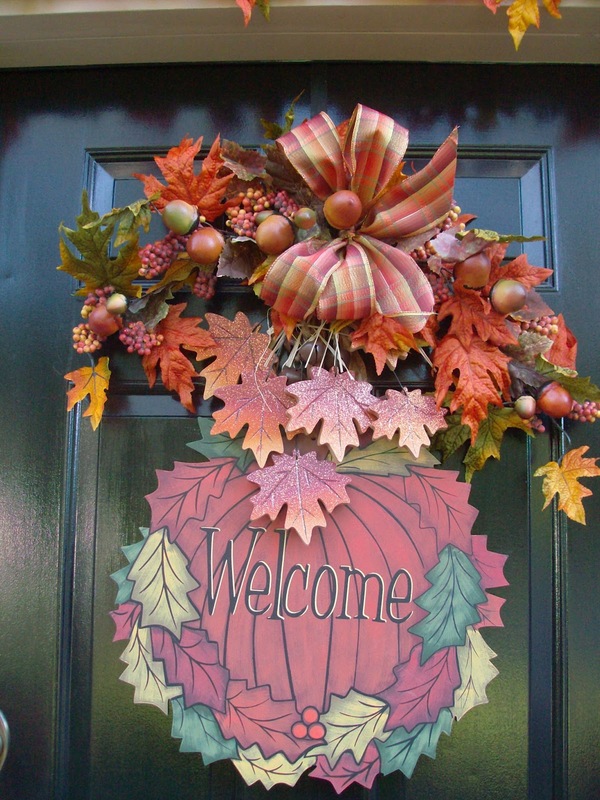 I hope you're all looking forward to fall's celebrations. This was last years Thanksgiving Day Table at my house, the final celebration of fall! As a thank you for subscribing to my newsletter I’m giving away this little Halloween prize pack. All you have to do is subscribe and LIKE my Facebook Author page so you can keep up with me. To subscribe to the newsletter go to my FACEBOOK PAGE leave a like and hit the envelope button next to READ THIS BOOK to sign up for the quarterly newsletter! *prize pack open to U.S. residents, by entering to win you give me permission to add your name to my mailing list, but you'll only get 4 newsletters a year with seasonal decorating ideas and what's new in my book world.